12 Days of Holiday Toy and Gift Giveaways! - Mamanista! 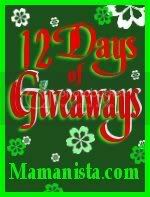 Home > Savvy Gifts > Giveaways > 12 Days of Holiday Toy and Gift Giveaways! 12 Days of Holiday Toy and Gift Giveaways! This Holiday Season, we’re hosting 12 Days of Giveaways! There will be safe (non-toxic and lead-free) toys, fun gifts, and hip baby clothing and accessories. Plus, even if you don’t win, there will be lots and lots of coupons, too, for savings. If you want to be notified by e-mail when we post a new contest: subscribe to Mamanista! by e-mail. 2. Comment on the posts for the contests you want to enter: Starting tomorrow, we’ll have a new contest almost every day. You’ll be asked to comment on the specific post for any giveaway you are interested in winning. You must comment on the individual post(s) so we know which contest(s) you are entering. You can enter any or all of the giveaways! Remember to share AND then comment on the specific posts for the contests you wish to enter. We’re only giving away safe and healthy toys and gifts for our 12 Days of Giveaways. Check out our Toys to Trust Guide to Gifts for even more fabulous choices! We have two more contests right now that are not part of the 12 Days of Giveaways and you just have to comment to enter: Win a Red Silk Pouch Sling from Bronwen Handcrafted ( ends 11/26) and Win a $50 Gift Certificate to Tiny Prints Stationery + Help Tiny Prints Donate Up To $50,000 to Children’s Charities (ends 11/28). Don’t miss out on a single fabulous giveaway, hip review or amazing deal: subscribe to Mamanista! by e-mail.